Star Fish Stamped Earrings. 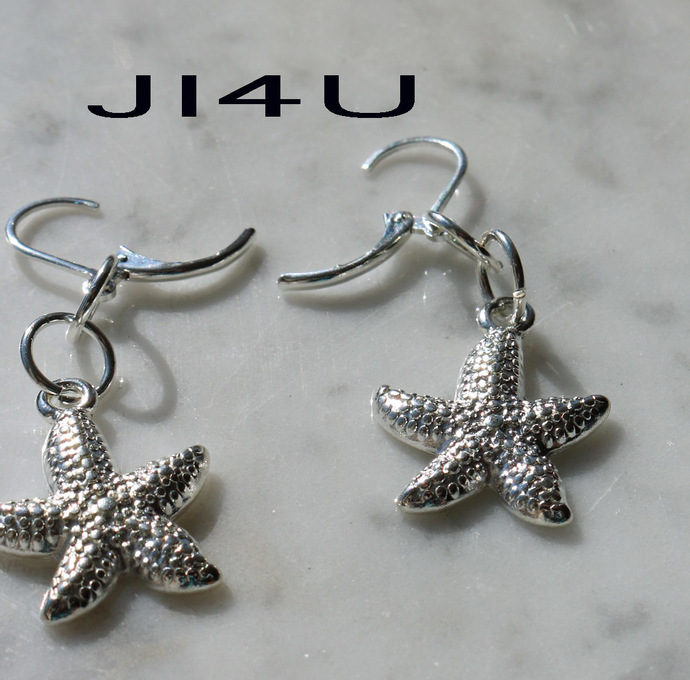 Five Point Dangle Earrings. Beach Jewelry. Nautical. Sterling Silver Nickle Free Earrings. Gifts for Women. Star Fish Charm.. Fish Hook. 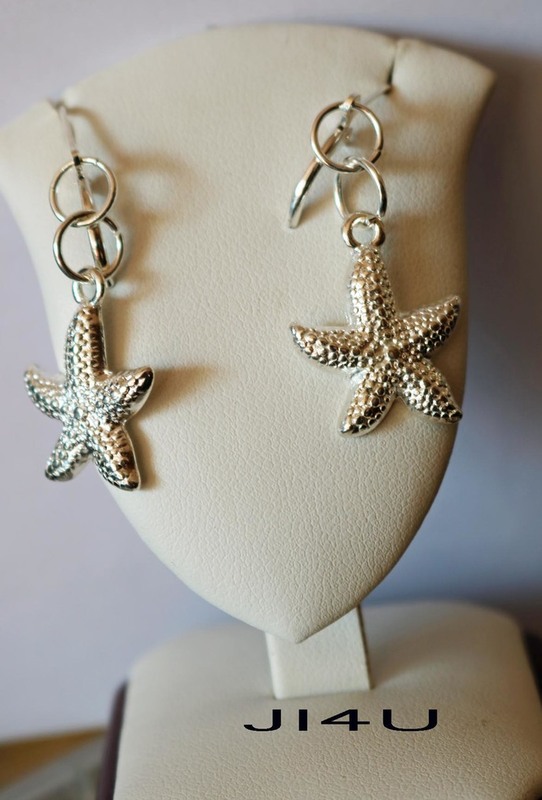 The seashore comes to life in these lovely star fish earrings, characteristic with lovely stamped finish and hollowed out backs. 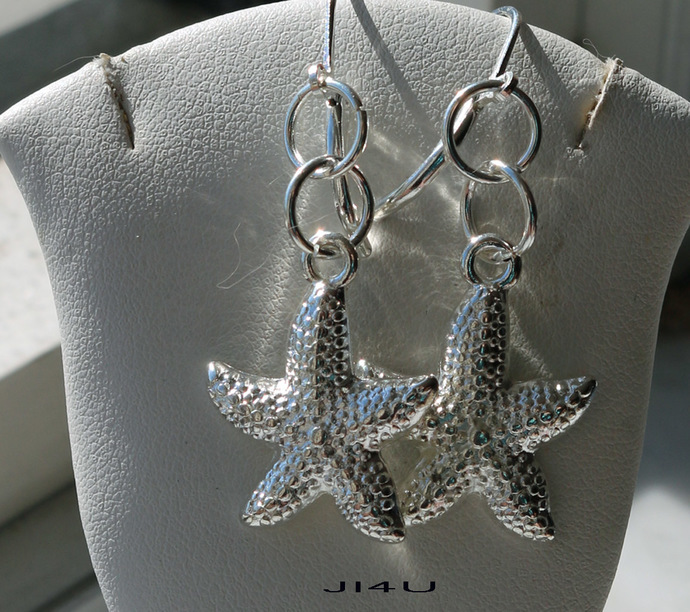 Five point star design is both delicate and strong, finished with matching sterling silver fish hook ear wires. Statement Earrings. Gifts for Her. Light and carefree as the summer breeze. Buy a gift just for you or your BFF (best female friend). Also available are the crystal Swarovski earrings shown in photo 5. Perfect for evening or day wear at the beach. Measurements: Suspended on two sterling silver jump rings and lobster ear wires. Measuring 4.5 cm ( 1.5 inches) in length. 3.5 c.m. (1.25 inches) across at the widest point. I highly recommend the lobster wires as they are self closing. You may choose the 'fish hooks' which come with silicon backs. Only one pair in stock. Shipping: All items are carefully package in jewelry box and bubble mailer to ensure safe arrival of your treasured item. Shipping to the USA takes 6-8 days by regular mail (no tracking) and to clear customs in both Canada and the USA. Canada Post requires a cell or telephone number for 'all' outgoing parcels via International mail. Please provide this at the 'note to seller'. Please provide a phone number Canada Post requires that for all items leaving the country. Tracking: You may upgrade to 'tracked' by choosing International Small Package to USA with tracking. Choose USA with Tracking or Expedited through Canada Post. International shipping is by regular post and can't be tracked.